We spotted this cardigan-clad duo on Valencia during one sunny Saturday in the Mission. Although it was the weekend, these two didn’t slack on the neat factor. The dark denim keeps it looking sharp and clean, but the bright colors in the accessories give a fun, casual vibe. I love the clean look of both outfits. Once again, I couldn’t help but notice the cardigans (probably the part that first caught my eye) but once you really look at the complete outfits, it is obvious that more thought went into their clothes than just throwing on a cardigan. 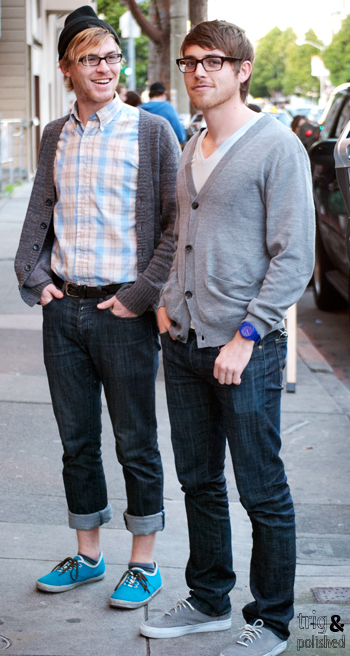 I love that the two men both wore cardigans but with their own take on them. It shows that no matter what your style, you can incorporate a cardigan into your wardrobe and make it your own look by experimenting. With the mysterious weather that is common in the bay area, cardigans are really the perfect choice when it’s sunny outside but still chilly in the shade.